Howard "Sceeved Out" Because Leno Only Gets $20 Million? Discussion in 'Howard Stern' started by Neigh, Dec 9, 2008. Howard "Schkeeved Out" Because Leno Only Gets $20 Million? Howard is now pissed off... actually "schkeeved out" - because Leno is only taking $20,000,000 from NBC. How crazy is this? He's furious because Leno won't demand more money?? He's so eaten up with hatred that he can't think straight. And I didn't hear a word of common sense from Robin or Artie. Am I the only one who finds this kind of thinking insane? Reminds me of the tirade a while ago that Leno had to be cheating on his wife because he's on the road so much. Is Howard still going to his therapist? explains why Howard hasn't retired yet. All about the money. c'mon now...the word is clearly "schkeeved"
I stand corrected. See if I can edit my post. Howard is obviously blinded by his pure hatred for Leno. Why does he care if the guy turns down more money because he feels he makes enough. Sounds pretty damn admirable to me. Totally agree with OP 100%. I listened to the segment and went, "WTF?" They're all bonkers and the HATE Leno. Artie lied about his Leno hate! I just heard that and figured it would get a strong reaction here. I think Howard has made little secret of the fact that it's 100% about money and maybe always has been. The topic of Jay Leno really makes Howard say crazy things....like the fact that he isn't so mad about Jay taking away John but is more upset about Jay Walking, which is barely "The Homeless Game". Robin spoke a little common sense although it was not directly about the salary thing. She said "Do you think that someday you'll regret all the things you've said about Leno?" Considering how many eyebrows the topic of Leno's "small" salary brings up against Howard's heavily inflated one, which many non-Stern fans would argue is one reason for the massive debt, that day might come sooner rather than later. Let's face it....if Howard's salary was a little lighter, I don't think the music lineup would such a massacre and the three measly stations without any equivalent and unique genres (Boombox, Strobe, Backspin) would still be around. Anyone remember the topic that was laughed off pretty quickly where someone asked if Howard would give up some of his salary in order to help Sirius. Chance of that is now clearly 0.0! However detrimental Howard's salary may be to Sirius now, the fact is that Sirius would have gone under years ago if they hadn't signed him. I agree with you. Its widely known that Leno really takes care of his people. He doesn't take huge raises and lets his staff get more money. I've heard that he makes sure Christmas is done right with his staff too. I'm not a fan of his or the Tonight Show,but thats pretty damn nice. Yes, that's absolutely true. But what if XM had hired Stern for roughly the same amount of money? Would satellite be in the same position it is today? The Leno hate is hard to get behind. If Howard wanted to keep Jon, he should have paid him better. By every account (except Howard's), Leno is one of the nicest guys in Hollywood. Personally I'm not a fan of his bland comedy, but he does seem to be a genuinely nice person. The Leno hate is hard to get behind. If Howard wanted to keep Jon, then he should have payed him better. By every account (except Howard's), Leno is one of the nicest guys in Hollywood. Personally I'm not a fan of his bland comedy, but he does seem to be a genuinely nice person. I remember John saying on the air that he asked Tom for a raise. Tom said he would rather die than give him more money. I don't think Howard had anything to do with it. I guess he was making $50,000 and he was offered $500,000 from Leno. I know Fred was real pissed that John left. I don't know if it's because of how he left or if it's the amount of money he is being paid on Leno. Howard always said he wasn't mad at John. He was mad at Leno because he never gave him a heads up. I don't know what good that would have done. Tom was super super cheap. Newsflash, Howard put Tom in charge of the marbles. Howard didn't want to be the bad guy. 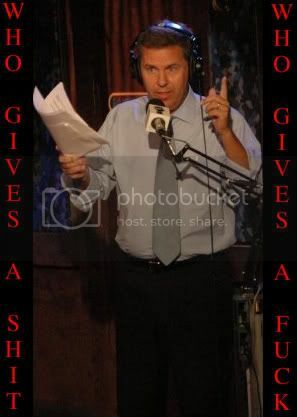 It might not have been his intention, but by hiring John to do the announcements and for the publicity that decision aroused in his show, Jay really made out quite well in the deal. On top of that, Jay got to publicly humiliate Howard by proxy. Sure it was Tim's call...I mean it was Tom's call to pony up money for John, but by hiring John for such a good pay day, it only proved to shine more of a light onto the building reputation of Howard keeping talent on the cheap. I am no Leno fan but I say good for Jay. Money isn't everything and I am pretty sure that Jay has more then enough to maintain his lifestyle if he never worked another day in his life. Also not a Leno fan (yet for some reason, I end up watching his damn show more often than the always funnier Letterman...then again, most of the time I'm on the computer and not paying attention) but I think saying that he is a bad guy for talking less pay speaks volumes about Howard. I can't imagine people listening and working for Howard weren't freaked out about that (and I don't know that Robin or anyone else was fully supporting Howard's position on that rather than just backing off). But I do agree that Leno is a big of an insincere robot. I sort of got that from an interview I just saw with him, too. By every account (except Howard's), Leno is one of the nicest guys in Hollywood. Personally I'm not a fan of his bland comedy, but he does seem to be a genuinely nice person. Jay also angered quite a few people during the writers strike. I believe he paid his people out of pocket, so I'm sure they like him. But the guys walking the picket lines who didn't quite luck into that position probably weren't that happy about it. I miss the Jay Leno that used to appear on Letterman back in the 80s.